April 30, 2010. Tags: breakfast, eggs, migas, recipe, tacos, tex-mex. Recipes. 8 comments. I swear I am doing things. A lot of things. I actually have quite a few posts ready to be written but for some reason (I’m a perfectionist.) it takes me forever to actually write each one. 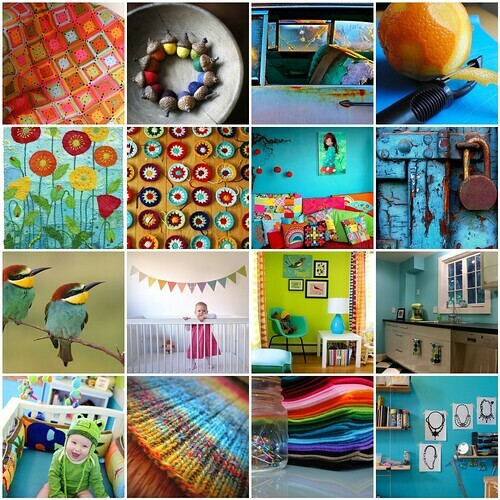 But for now, I want to talk about color. I’m finding it interesting to notice how my own tastes change with age. Sometimes drastically. One major change is color. I am appreciating colors more and more and I believe it all started with knitting. Before I began knitting, if I saw all of these colors together, for some reason I would instantly think of those raver kids with their plastic necklaces and cut up clothes or Rainbow Brite. But now, all I think is “happy!” I started knitting and colors began to come together very differently. Standing in my local yarn store, I would stare up at the cubes and I saw not only color but texture, contrast, and compatibility. I also have a theory. I think colors and how people use them may have something to do with location and weather and seasons. Here me out. Austin is hot. Hot and dry. All the time almost. You get sweaty and dirty really easily. Hardy ever did I see people sporting multi colored sneakers or bright yellow skirts. Lots of neutrals, which makes sense when the sun is beating down on you and you’re sweating all over everything. Also, spring isn’t the same in Austin as it is in New England. There aren’t bulbs of all sorts and all colors of the rainbow blooming everywhere. There aren’t trees any color other than green there. The grass is green for a couple of weeks and then it’s dead again. In New England, I see color. LOTS of color. If you live in a place that actually has 4 seasons, you may find yourself missing the very colorful one so what do you do? You emulate it. You reproduce it in the dead of winter when there is no color to be found anywhere. When you’re surrounded by a complete absence of it, you produce an abundance to remind yourself of what has been as what will once come again. yellow=daffodil and sun=pretty, colors, spring, flowers, dresses and warm=happy! Before moving to New England, I never understood the fall color palette. Can you believe I was 28 years old before I saw, with my very own eyes, rust, yellows, oranges, and reds all together at once within the trees? I’m so excited to be on the color side of things. So I totally get it now. Although I still hate “coral”/”salmon”. April 30, 2010. Tags: Austin, colors, complimentary, design, fall, fashions, Knitting, new england, rainbow, seasons, spring, summer, Texas, weather, winter, yarn. Art and Neat stuff, Uncategorized. Leave a comment. The final installment is here! My husband swears he never liked black beans until I made them for him. These are my black beans. I love them. I hope you do too. Night before: Put beans into your pot with twice as much lukewarm water and cover. Let them soak overnight. Strain and replace water the next afternoon and continue soaking. Hopefully I will have a prettier picture of this dish later on but this will have to suffice for now. April 23, 2010. Tags: black beans, recipe, tex-mex. Recipes. Leave a comment. I forgot to mention I know that I have been skimping on pics lately. There is a good reason for that. They all look like crap. BUT I did get a new camera that makes me feel like a whole new woman! I can’t wait to start sharing BEAUTIFUL foodie pics with you. April 21, 2010. Uncategorized. Leave a comment. Welcome back! 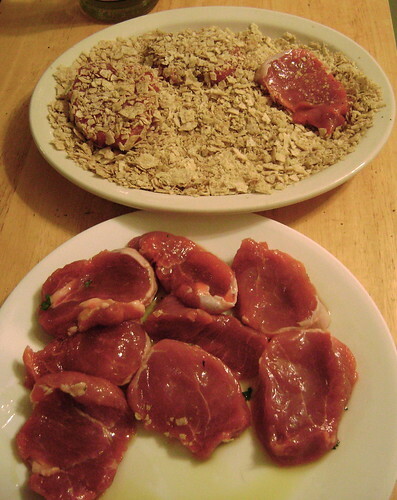 Here are the two toppings that most definitely must accompany the crunchy tenderloin medallions. Although simple, these play an important role in the experience of this refreshing dish. The first being the tomatillo sauce. I do not refer to this as salsa verde for a number of reasons but one is because it is not to be cooked. The tomatillo sauce being fresh, cold, and uncooked, provides a tangy and refreshing start to the meat. Next is a very basic pico de gallo. I always mix a bit into my spoonful of black beans. I feel the texture and temperature of this is what’s important. I will suggest heirloom (or ugly) tomatoes in the recipe but that is just a personal favorite of mine. Remove husks/skins from tomatillos, rinse and rough chop tomatillo into quarters. Combine all ingredients in food processor and pulse until smooth. Store covered in refrigerator. *Learn more about how to choose good tomatillos here. *An arbol chile’s seeds are almost strictly for heat so you may disregard if none is desired. If you are interested in the flavor of the pepper, you can discard the seeds and use the pepper ground. Come back Friday to get the final step for this meal! April 21, 2010. Tags: "arbol chile", "pico de gallo", fresh, raw, recipe, sauce, tex-mex, tomatillo, vegetables. Recipes. 1 comment. This is one of my favorite meals and I realized I have promised to post it 2 different times so I suppose I must finally follow through. I saw the original recipe in Southern Living magazine but ended up just using the idea instead of the recipe. It is such a wonderful eating experience as you get crunchy with tender, hot with cold, salty and sour with fresh. It’s incredibly satisfying! Also, (now, don’t quote me on this because as you may know, I am certainly no expert on the subject, BUT…) I think it may even be a bit healthy. I believe I have been procrastinating it as I feel I will need to do it in 3 parts because it is a meal and not just a recipe. That DOES NOT mean it is difficult or involves any complex ingredients. I’m looking forward to you thanking me so give it a shot once all three parts are posted! April 19, 2010. 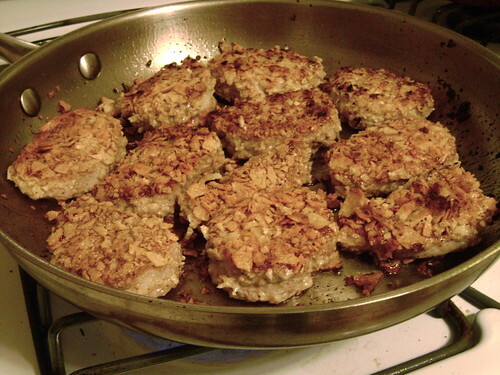 Tags: "pork tenderloin", crust, dinner, meal, medallions, tex-mex. Recipes. Leave a comment. dental floss around with you everywhere? A clothes line while traveling (in your vehicle, staying in hotels or camping). Sew up a tear or sew on a button. Use it when your fishing line breaks. Truss a turkey. Wrap your roast. Cut soft cheese and cakes while on a picnic. and of course, keep those pearly whites shining! April 18, 2010. Tags: dental floss, Tip O' the Week, tips, tricks, uses. Tip O' the Week. Leave a comment. I am officially married to my best friend in the whole wide world! I want to spend a while on a good post about nothing but the wedding so I will come back to that later. Right now, I’m a bit more interested in some…remembrance or out loud reflection, I guess I should call it. We got married in my home town of Austin and I am really happy that we had another trip there after accepting the job offer for Madison. It turns out that our trip and stay there actually did the opposite of what I was expecting. It made me much more excited about Madison. I did not find myself thinking, “I really wish we could have ended up here again” or “I am really going to miss this city”. (O.K. I was thinking about how much I miss the weather.) Unfortunately, I was thankful to not be going back. Of course, my whole family is in Austin and so are a few very great friends, so that is the given thing I will miss. I have a handful of friends I have known for, going on 10 years. Unfortunately, in this trip, I realized that a few of them are exactly what I don’t want in a friend at this point in my life. I used to party and drink and I was a complete social butterfly. The more friends the better. (I realize now you need a lot when they are so unreliable!) It was fun and perfect for me while I was young and responsible for no one but myself. I am a grown woman now. You may not know by looking at me but I am educated and reasonable. Mature, considerate, and polite (usually). Most importantly, I am dependable and I treat people the way I want to be treated. One of these older friends is an alcoholic. I knew I was taking a big risk involving her but I wanted to know that I gave her an honest shot at proving that she could act like an adult that cares about others. I spent an entire year preparing myself for her absolute worst possible behavior. Luckily, what I witnessed was not as bad as the worst thing I could think of but was nonetheless, incredibly ungracious. First, I had to give special instructions to my bartender about how she should be served “extra light handedly”. It ended up not making a difference. She was high on pills, drank what she could, passed out in a room, was rude to my photographer, insulted me, and just did whatever necessary to make sure that someone was paying attention to her at all times. I am no longer interested in someone like this. I loved her once but she made sure that most of my wedding day was all about her and no one in their right mind would want to be friends with someone like that. Lucky for me, the other real friends involved ARE good friends and they did everything they possibly could to keep this all in check and far from my mind and worries. They babysat her is what they did. They babysat a grown woman so she didn’t hurt any feelings or piss anyone off. And she ruined my wedding day for them. It was a gift to them from me as well as the other way around and they did not get to enjoy it the way they should have. I had another old friend drop in later. She originally R.S.V.P.d on behalf of her and her boyfriend (who WAS invited) and said they would be attending. She actually showed up later, in the middle of the reception, and brought another person who was never even invited as if it were a B.Y.O.B. barbeque or something. Really?! I don’t know any sane adult who would think it would be o.k. to just drop in to a wedding uninvited, do you? I later saw her boyfriend had shown up also. She came straight from work in her work clothes because she didn’t want to miss it. O.K. Look, that’s a sweet thought but if that is your plan, you tell someone. Tell the bride, “Hey. I would love to say I can come but I will have to work until the middle of it. Would it be acceptable to drop in to say hello later during the reception? No problem? Great. Is it acceptable to bring other people who aren’t invited? No? Okey doke.” I was baffled at this behavior. Honestly stunned and speechless. What do you say when sweet people are senseless? I was also very sad to see that the east side of Austin has been taken over by bars. That’s where I would have lived. That was where I wanted to raise a family. For a little while it was really growing with families and community groups and healthy little indie businesses. Now it’s just a neighborhood of bars. I’m really getting a creepy Starbucks type vibe from it. I also feel that friends in Austin would expect me to raise a family in a way that I won’t. I am surprisingly old-fashioned and that doesn’t sit well with a lot of hipsters. Having said all that, those were the WORST things about my wedding and I think that’s pretty damn awesome because really, none of those things are very bad at all compared to some of the horror stories I have heard. So really? My wedding was god damned PERFECT. That’s right. PERFECT. I’ll tell you all about everything that made it so perfect soon. I am still regaining my energy, battling allergies, preparing myself for lots of travel and more major exciting news in the next 3 months! April 15, 2010. Tags: "bad friends", "good friends", "wedding manners", alcohol, Austin, bars, disappointment, family, friends, love, Madison, marriage, moving. Me and Mine. 3 comments.